prohibition – What's Cookin' @ Special Collections?! The objects of this pamphlet are: First, by means of actual photographs, to illustrate the progress and success of one of the most important industries of New England–a progress which is none the less interesting because its moral is, “Whatever you do, do it well”: and, second, to give a general description of the methods which have been (and are being) employed by one of the famous breweries of the world to obtain perfection both in brewing and in bottling. This pamphlet was a new find on the shelves for me, and it’s a great, photograph-laden tour of the brewery and the brewing process. Most of the pages include several images, like these examples! My favorite page was the last one that includes the label art from the brewery and a nice description of the beers the company produced at the time. (Please note the “Nourishing Stout” which was “highly recommended by the medical faculty in all cases of weakness or during convalescence.” ) Much like the bitters and patent medicines, beer also had a place in medical history! If you’ve never heard of the Frank Jones Brewery before, don’t feel bad. While it had a long run in one form or another (1854-1947), the Frank Jones Brewery, like many others in the alcohol business, was crushed (like an empty beer can?) by Prohibition. It closed its doors when New Hampshire as a state banned booze in 1917 (many counties already had restrictions in place). While a brewery reopened on the site after Prohibition ended, it wasn’t called the same thing. From 1933 to 1937, it was the Eldridge Brewing Company of Portsmouth, named for a former rival of Jones’. After that, the brewery reverted to the Frank Jones Brewery (whose recipe the owners had been using all along) and the name of standard ale was renamed “Frank Jones Ale.” Pre-Prohibition, the brewery was widely available and a strong competitor with brews from other large New England and northeast cities. Later, though, it lost some of its market. There is an interesting history of the brewery online that explains all this in more detail for the curious. Frank Jones himself, in addition to his reputation as a brewer, was also known as a politician. He was a Portsmouth mayor, a New Hampshire Congressman, and failed gubernatorial candidate in the last third of the 19th century. He was born (b. 1832) and raised in New Hampshire and actually died the year this booklet was published (1902). On National Beer Day, a pamphlet like this reminds us to give a little tip of the hat (or clink of the glass) to Mssrs. Cullen and Harrison and the demise of the Volstead Act, without which we wouldn’t be collecting these cocktail and beer history materials today! Repeal Day is on almost here! 82 years ago on Saturday (December 5th), the 21st amendment was ratified, giving America back the legal right to transport and import (and consume!) alcohol. It also means this is a time of year when I always put up a feature about something relating to cocktail history, something I started back in 2012 (search “repeal day” on the blog and you’ll find the three previous posts, as well as some others discussing the history of Prohibition). However we may differ as to method, we all agree that temperance is one of the cardinal virtues. In dealing with the great social problems in my own State, such as the care of the wards of the States, and in combating crime, I have had to consider most earnestly this question of temperance…But the methods adopted since the World War with the purpose of achieving a greater temperance by the forcing of Prohibition have been accompanied in most parts of the country by complete and tragic failure. I need not point out to you that general encouragement of lawlessness has resulted; that corruption, hypocrisy, crime and disorder have emerged, and that instead of restricting, we have extended the spread of intemperance. Some classic (and perhaps a few unfamiliar?) cocktails. How about a toddie (toddy)–they aren’t always warm drinks–or a collins? Some non-alcoholic options and some dressed up lemonades. Many cocktails fit into a category (collins, daisy, cobbler). Others fall more in the “miscellaneous” category, like these! Driscoll, like many other bartenders, appears to have spent at least part of Prohibition abroad–in this case, working in, as he puts it, “Tia Juana.” His diversity of employment is reflected by a diverse knowledge of cocktails, punches, wines, syrups, and non-alcoholic drinks. At the same time, The Home Bartender was likely published before December 5, 1933, and as a result, it’s a nod to the one place a person could legally consume alcohol…providing they hadn’t transported or imported it. (I’ll leave that puzzle to be solved another day.) So, get creative with something unfamiliar (a brandy float!) or mix up your favorite classic cocktail (toddy season is nearly upon us!) this Saturday. Cheers! Tuesday (April 7) was National Beer Day–and not just for any old reason, I assure you. April 7, 1933, was the day the Cullen-Harrison Act went into effect. “What’s the Cullen-Harrison Act?” you might (rightly) ask. Enacted on March 21 and signed by FDR on March 22, this 1933 piece of Congressional legislation provided for the sale of beer (or wine!) with an alcohol content of 3.2%. Although it was no guarantee that beer or wine would suddenly be available on April 7 (individual states had to pass further laws granting the sale), it did signal the beginning of the end of Prohibition in the America (the 21st Amendment would be passed in December 1933). Back in 2011, while going through some unprocessed materials, I found a single letter. At the time, it seemed mildly interesting, but other projects had priority. Before long, though, we were acquiring materials on the history of the cocktail and Prohibition, and the letter eventually popped back in my head. 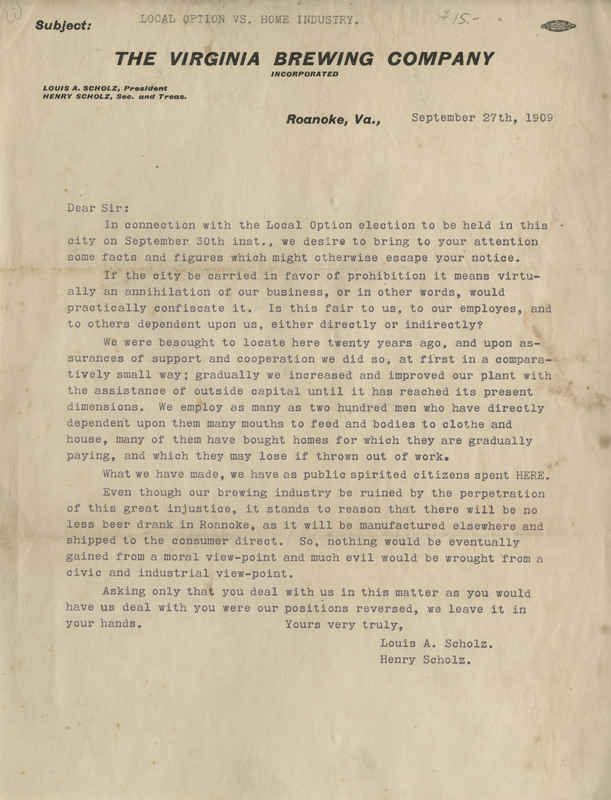 Written in 1909 by the president and secretary/treasurer of the Virginia Brewing Company, it was a plea not to pass legislation that would ban the manufacture of beer in Roanoke. The Virginia Brewing Company (for which there is a GREAT short history online that helped me out! ), as the letter suggests, was well established in the Roanoke area. It began in 1889, started up by none other than the Louis A. Scholz on the letterhead. Louis (1863-1934) immigrated to the United States in 1882 from Germany. After starting out in Baltimore, he eventually settled in the Roanoke area and raised at least three children with his wife, Henrietta. In 1916, the brewery closed. Louis found work (the 1920 census lists him as the manager of a bottleworks) elsewhere, until Prohibition blew over. He planned to re-open the Virginia Brewing Company, but died before the new plant was complete. A new owner opened it in 1936, however, and it stayed open until 1958 under the original name, and as the Mountain Brewing Company from 1958-1959. Louis’s brother Henry (abt. 1866-1924) came to the United States in 1890, specifically to help his brother start the business. He and his wife, Louisa, had at least two children. In 1920, according the census, Henry appears to have been owner of “moving picture co” in Roanoke. (He had actually co-owned the theater since 1913). A little further digging revealed this to be the first American Theatre, located, at the time, on S. Jefferson Street. However, Henry had his hand in MANY businesses in the Roanoke area during his life there, including the raising of Roanoke baseball team to join the Virginia League, the movie theater, and one of the first newsstands in the city.